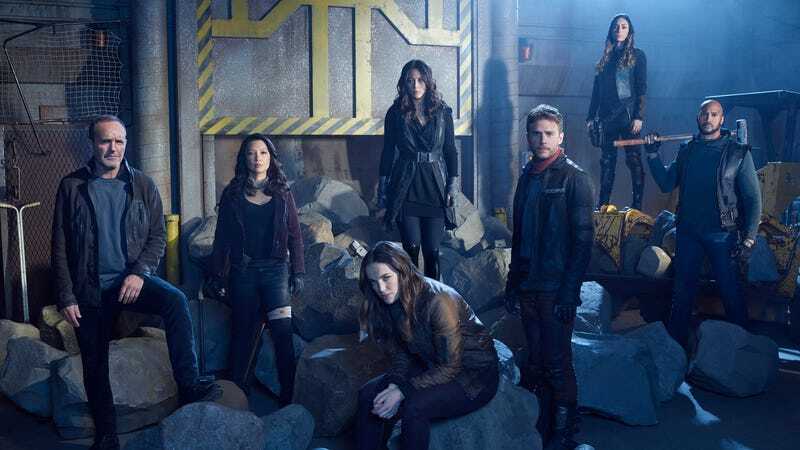 Shocking new study says that people really like Agents Of S.H.I.E.L.D. For years, Marvel’s Agents Of S.H.I.E.L.D. has been ignored by the Marvel Cinematic Universe that birthed it, with Agent Coulson’s resurrection and the rise of Chloe Bennet’s Inhuman hero Quake having absolutely no impact on the larger movie universe—despite the fact that Iron Man and Captain America would probably be pretty happy to know that their buddy Phil is feeling better, not to mention that the rest of the S.H.I.E.L.D. gang could’ve helped out while fighting Ultron or Thanos or Kang The Conqueror (he’s gotta be out there somewhere). Apparently, though, the show’s general detachment from the larger MCU is unwarranted, as is its eternal status on the bubble of cancellation at ABC, because a data research company called Parrot Analytics has determined that Agents Of S.H.I.E.L.D. is actually way more popular than anyone thinks. Parrot Analytics gave this stunning report to Screen Rant, which says the “brand” of Agents Of S.H.I.E.L.D. is not only stronger than Netflix’s Marvel shows like Daredevil and Jessica Jones, but that it’s in “the top 0.03 percent of in-demand TV shows worldwide.” That puts it on par with Better Call Saul, Vikings, and Criminal Minds in terms of the organization’s brand assessment metrics. Those are based on “everything from global file-sharing and peer-to-peer traffic to social media activity,” which Parrot Analytics believes to be a good way to determine how popular a show truly is without putting all of the weight on regular ratings. Granted, a lot of general buzz and positive hype doesn’t make Agents Of S.H.I.E.L.D. as popular or successful as Avengers: Infinity War, but it does suggest that the general public (and ABC) might be a little too eager to write off the show. Cap and Iron Man probably won’t start begging to hang out with Quake and her pals, but maybe they could at least acknowledge their existence from time to time—though some A.V. Club writers in particular would be more excited to see Spider-Man acknowledge the existence of Daredevil.